Talen-Jush is an Argonian who can be found in Root-Whisper Village. She is willing to speak with you about the concept of shunatei. "So much agony has taken place here. So much pain. But to wallow in such sorrow will only invoke shunatei. We cannot allow what has come to pass stop us from working towards a new tomorrow." "Shunatei means something along the lines of "regretful stomach" in the dryskin tongue. It is the pain caused by holding on too tightly to that which has come to pass. Sorrow, anger, suffering. If you do not let them go, they will consume you." 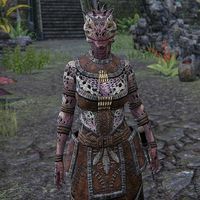 Is this concept important to Argonians? "Of course. Our culture revolves around accepting change. We build homes of wood, knowing they will break in the storm and be rebuilt again. Know that all things are not permanent, and accept that. Only then can you find peace." This page was last modified on 7 February 2019, at 02:29.